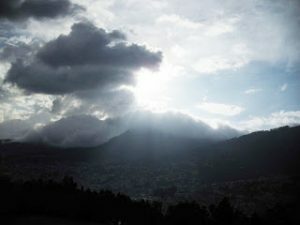 I am back from my trip to Quito, Ecuador where I evaluated a hotel for Best Western. It was a short trip, but very memorable. 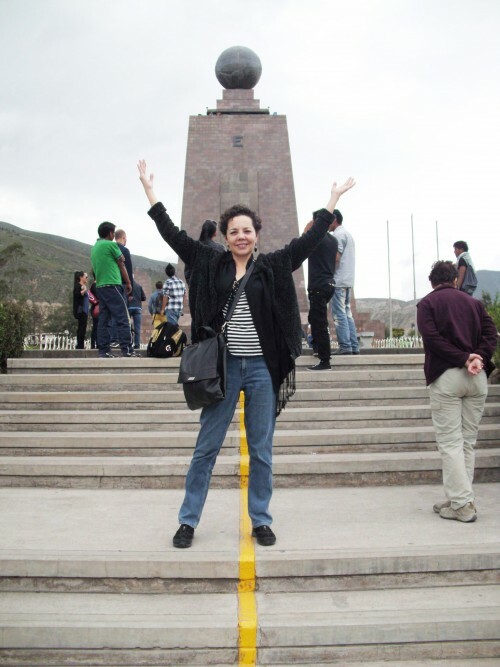 I was able to stand on the equator, the yellow line is the dividing line, “Mitad del Mundo” (the middle of the world). Smack dab in the center of the world. What an experience. 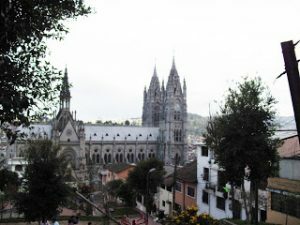 The hotel that I visited is the only Best Western in Ecuador and located in the center of Quito. 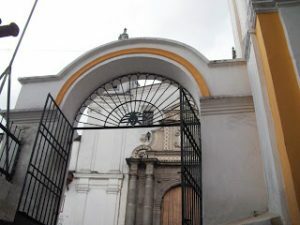 Across the street from the hotel is the city’s largest shopping center, and the historic colonial district is not far away. 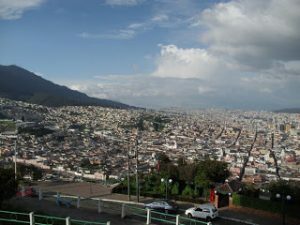 Quito is the highest capital city in the world, with a population of about 2.5 million. When I arrived I was told that many experience some real issues due to the altitude. Lucky for me, I felt fine. The people I met with were lovely, and I was able to get some insight into the country and culture. They use the US dollar for their currency, it is my guess that has really helped to stabilize the economy, etc. 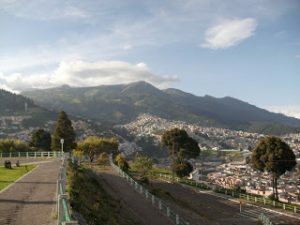 The cost of living seems high, discussed some basic items with the locals as far as costs and for instance a head of lettuce runs about $3.00, homes average between 80K and 100K with pent houses in the center of town costing around $1,500.00 per month. However, the average wage is $300.00 per month. Autos are more expensive there it sounds like they run about $5K-$7K more than in Phoenix, and most don’t have the necessary safety features that are required here, i.e. airbags, etc. Getting around town in a car involves some forethought. Due to the city’s density , pollution, population – they have restrictions on dates/times of car travel based on license plate numbers. They have a new airport, small by our standards but nice, which just opened about a week before my arrival, and is about an hour out of town. 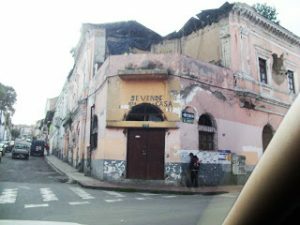 I arrived late at night, and as we drove to the hotel – I saw many homes and businesses along the sides of the road. Most looked more like shacks from my vantage point. Almost no lights on, aside from the street lighting which was pretty intense. Hardly any graffiti. 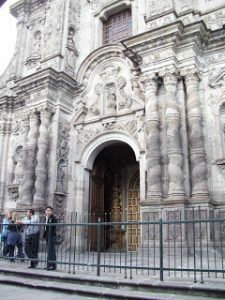 We arrived at the hotel – it is about 19 years old and has an old world design feel, which included ornate interiors and an extensive art collection in the lobby with impressive colonial style pieces. This is a city of such history and beauty. The hotel is a nine story structure with incredible views of the city from each story. Soon a Sushi Bar will open on the 9th floor which will have stunning views as well. I was shown such hospitality by the hotel and the manager and staff could not have been nicer. 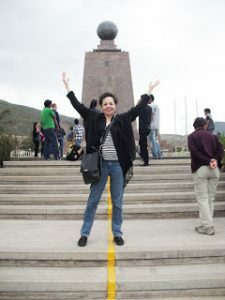 I was given a private tour of the Equator which is located not far from the city and is situated in a park with museums, gift shops, restaurants, etc. 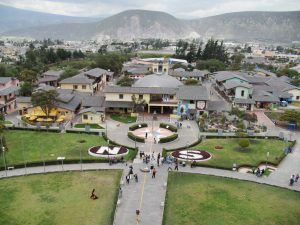 where the art and culture of Ecuador can be enjoyed. I was not familiar with the local art and artists. I saw a small museum with the artwork of Oswaldo Gyayasamin, who I was told is the most famous of Ecuadorian artists – world renowned. The museum was small, but I was quite enamored with his work. After the visit to the equator, we went to the Colonial part of town. I was short on time so it was a car tour. 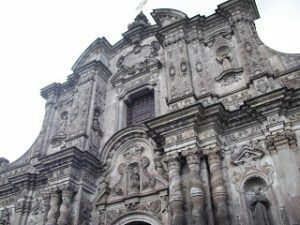 I did take a few photos along the way, and the architecture was amazing. See photos below for some examples of the old town area. We drove up to a mountain, Mirador de Panecillo. 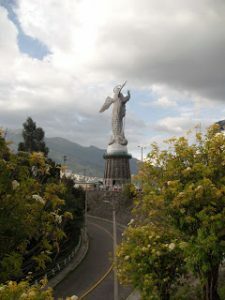 The statue of the Virgin Mary stands on top overlooking the city. 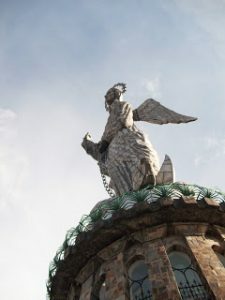 Visible from most of the city, and based on a colonial statue of the Virgin of Quito, the 134 ½ foot tall aluminum monument was erected in 1976. 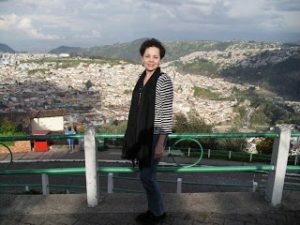 Had to take a flight back with a 7AM departure – way too early, but must say I will always remember this trip and the wonderful hospitality I encountered. While reviewing the hotel – I provided some ideas/sketches, below I have shown a few of the ideas I had. The exterior parking lot had a variety of plant types – not of a clear theme. As seen below. 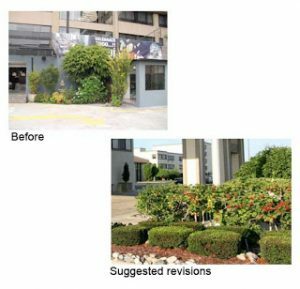 As a suggestion for providing a more upgraded consistent appearance I have shown below a suggested look for that area of planting. Note: provide planting of varied heights, nicely trimmed with rock and other ground covering. In the lobby there are several seating areas with furniture which is identical in style and fabric. It is necessary to replace the sofa with a fully upholstered sofa. 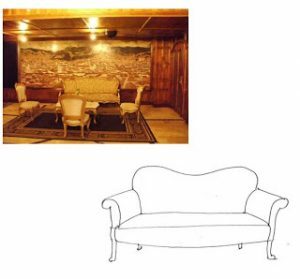 Ensure that the sofa incorporates the cream tones of the lobby as well as blue or green tones such as are provided in other areas of the hotel. Provide side tables to coordinate with this arrangement. A new large area rug which coordinates with the color scheme should be added as well.